Size: 28 in. by 38 in. A fabulous antique pictorial hooked rug made from dyed fine silk stocking strips (the same materials as used in the making of Grenfell Rugs). We are showing closeup photos of the front and back. 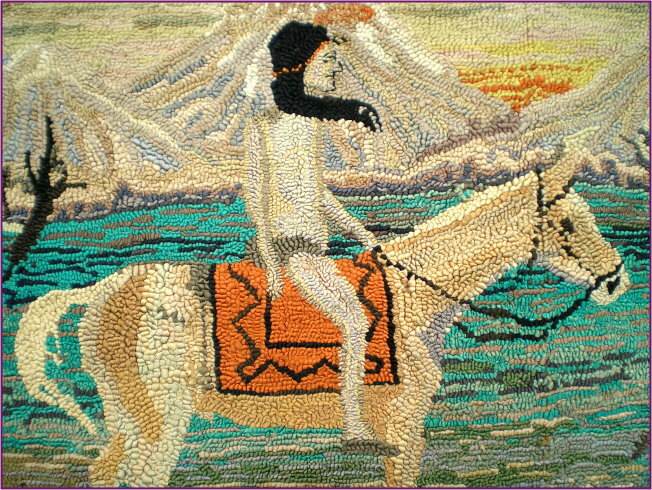 The rug's outer border is made of black braided silk strips. This rug is in good condition with no apparent or obvious visual flaws. As aboriginal Native American motif hooked rugs are not commonly found, this specimen, in outstanding colour and condition, should be considered a genuine rarity.